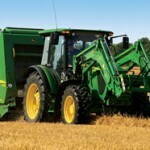 John Deere has made changes to its high-spec 5M model lineup. 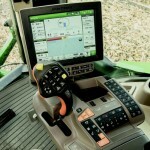 These updates include the addition of aftertreatment systems to meet Final Tier 4 compliance, and a host of comfort, convenience, and performance features with model year 2015 tractors. 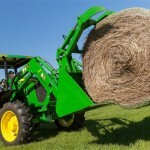 The changes impact the complete range of 5M Utility Tractors, ranging from 75 to 115 hp. 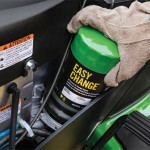 The 3-cylinder 5075M model will have John Deere’s diesel oxidation catalyst (DOC) and diesel particulate filter (DPF) solution with no diesel exhaust fluid (DEF) required. 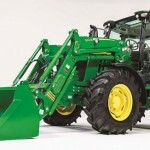 The 5075M will also feature modern styling with chrome headlight bezels, a full range of isolated open operator stations and cabs, and new factory installed options such as front fenders and cab fender extensions, according to Brad Aldridge, product marketing manager for 5M Tractors at John Deere. The 4-cylinder 5Ms (5085M, 5100M, 5115M) will have a DOC/SCR (selective catalytic reduction) solution using DEF to meet Final Tier 4 emissions standards. They also feature a compact cooling package and a new, low sloping hood designed to improve efficiency in loader applications. 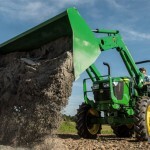 Their powerful 4.5 liter John Deere PowerTech engines are designed with an increased power bulge of up to 4% and a 30% torque rise for improved performance under load. Servicing of the cooling system is easier thanks to a slide out condenser, sliding oil cooler, tiltable charge air cooler, and removable radiator screen. Optional LED worklights provide brighter lighting for working late in the day or early in the morning. “Other feature updates include fully isolated operator platforms, increased cab storage, a premium LED instrument cluster, an optional low frequency air suspension seat with heater, and an expanded line of larger Group 44 radial tires,” says Aldridge. An updated radio and speaker system in the 5M includes two front-mounted 4×6 coaxial speakers and a subwoofer behind the seat. New front sunshade and sunroof design further enhances convenience and ease of operation. These improvements are on top of the 16F/16R PowrReverser and 32F/16R PowrReverser transmissions, heavy duty hitch capacity, and hydraulic capacity.